Gubbio is a wonderful small medieval city in the hearth of Italy, full of traditions and strongly linked to its past. It is one of those places where even the most serious Martini traveller would not look for a Martini bar, accepting to go for some other options (the wine in the region is very good). This is why the Fusion Cafè is a great surprise: a cocktail oasis in town, the Fusion is the place to go for a Martini in town. The bar crew is very friendly, the choice of finger food is amazing for quality and quantity, and the cocktails are not bad at all. 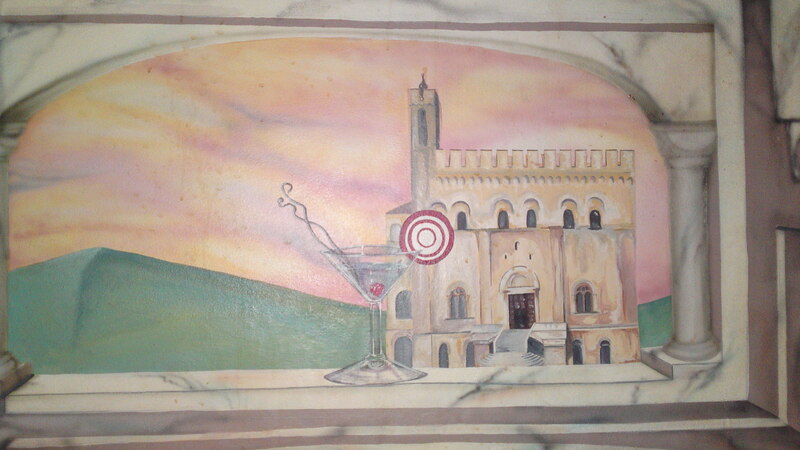 Behind the bar, have a look at the nice fresco of a Martini with the Palazzo del Consoli. Interestingly, they prepare a very good martini but they live the ice in the glass, in the 60′ fashion: for sure this is not for purists, but the result s not bad at all. Classic Martini rate; 6,5.